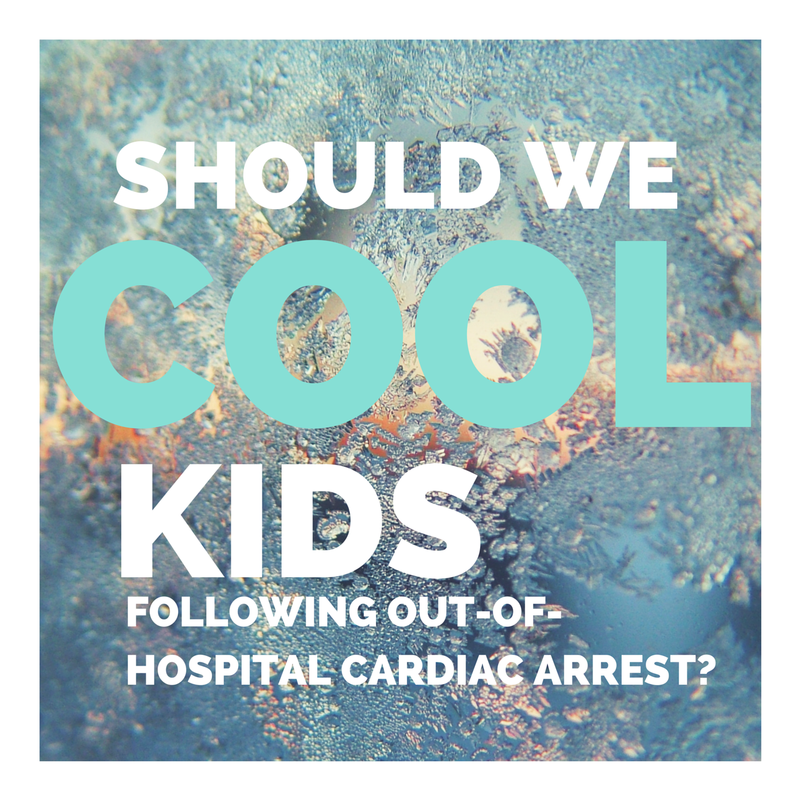 15th May: Should We Cool Children Following Out-Of-Hospital Cardiac Arrest? Does therapeutic hypothermia increase the proportion of patients surviving at one year with good functional status following paediatric out-of-hospital cardiac arrest? Intervention: subjects were randomly assigned in 1:1 (permuted blocks stratified by age) to therapeutic hypothermia (target temperature 33°C) for 48h then normothermia (target temperature 36.8°C) for 72h, or normothermia for 120h. Active cooling was undertaken in either case to achieve the target temperature. Participants: 295 patients randomised between September 2009 – December 2012. 155 were randomised to hypothermia, 140 to normothermia. In comatose children who survive out-of-hospital cardiac arrest, therapeutic hypothermia, as compared with therapeutic normothermia, did not confer a significant benefit with respect to survival with good functional outcome at one year. The study was utilised multicentre collaboration to recruit a sample with 85% power to detect a 15-20% difference in the primary outcome between treatment groups. This was a pragmatic design; although the subjects and those providing care to the patients could not be blinded to the intervention, reasonable steps were taken to ensure that the investigators recording the primary outcome were a) independent from those delivering care and b) blinded to the arm of the study to which subjects had been randomised. Unlike other studies, the normothermia in this case was also an active decision; the patients’ temperature was actively controlled according to the group to which they were randomised. The authors tells us that other than the temperature targeted, care between the groups was identical although they later state that “all other aspects of care were determined by the clinical teams.” This does leave us to wonder what if and how knowledge of the treatment arm and expectation of its efficacy (or otherwise) might have influenced those treating clinicians. There was no statistical difference in survival with a good neurological outcome at 12 months between the two groups. In the secondary outcomes, there was no difference in absolute survival between the groups, nor in the reduction in neurological performance score, however there was increased incidence of hypokalaemia and thrombocytopenia in the hypothermia group and increased requirement for renal replacement therapy in the normothermia group. Results were analysed using intention to treat analysis, which includes subjects in the final analysis of the arm to which they were randomised irrespective of whether they dropped out of the study or received an alternative treatment in the end. This is a conservative approach which can help to ameliorate the effects of unpleasant side effects of treatments; there’s a nice explanation of intention to treat here. It helps give us a realistic expectation of the results we might see in clinical practice. In this study the null hypothesis was no difference between the groups, this study doesn’t prove that hypothermia is harmful or not beneficial; there is simply insufficient evidence to reject the null hypothesis of no difference, based on this study. We should continue to follow local protocols in terms of cooling but this paper does give clinicians a little additional confidence in deviating from protocols if indicated. Is there evidence for cooling patients following in-hospital cardiac arrest? Would a larger sample size demonstrate a benefit and is this feasible? This entry was posted in Critical Appraisal and tagged #FOAMed, #FOAMped, cardiac arrest, FOAM, hypothermia, resuscitation on May 15, 2015 by PEMLit.